Dr. Rosalind Norman doesn't mince words. "I believe love for the arts especially music, which has been documented to aid in healing individuals, should be a common ground for bringing together people from diverse cultures and to restore a sense of community that bridges race relations in support of blues music in the community," she wrote here. Her insights set the tone for the February 4 kick off of the Race and The Blues in St. Louis Conversation Series at The Stage at KDHX. The collaborative venture between the St. Louis Blues Society and KDHX, a three-part series that takes place throughout Black History Month, opened to a full house. Allison Wilson, KDHX's Chief Engagement Officer, and Jeremy Segel-Moss, St. Louis Blues Society Board Chair, worked closely with the moderator, Dr. Norman, a Webster University business professor and longtime black theater advocate, to design an interactive program. The first conversation, The Past: Stigma of the Blues, featured St. Louisans prominent in the music community: Bernie Hayes, an entrepreneur, broadcaster, author, civil rights activist and media professor Webster University, Uvee Hayes, a school psychologist, songstress and recording artist, Jimmy Hinds, an internationally recognized bass guitarist, and Marsha Evans, an educator and blues singer. Dr. Norman, affectionately known as Dr. Roz, immediately engaged the audience by having volunteers read quotes and the definitions for the words "stigma", "authentic", "culture" and "tradition". The definitions spoke to the heritage embedded in the quotes: "It's as though we were a picture, trapped in time: This had been happening for hundreds of years, people sitting in a room, waiting for dinner, and listening to the blues." - James Baldwin, author and social commentator, and, "It's my truth, it's a lot of people's truth, and it's one that was missing from the conversation" - Jordan Peele, actor and director. The panel got straight into their experiences. Bernie Hayes grew up in segregated south Chicago, hearing that "the blues was low, beneath our standards." It took years to get beyond that perception and learn "what a wonderful historical genre this is." He also warned about how things get stigmatized by movies like "Cadillac Records" and "What's Love Got to Do with It" that leave "a false perception of what blues and soul really is, specially to blacks in America." With Hinds, Evans and Uvee Hayes, blues came into their lives early. Hinds says he first learned about the music by deejaying for his parents' card parties and from a "daddy who was from the Delta." Evans grew up in house surrounded by all kinds of music from opera to a "Grandma who played the blues with her boyfriend on the sax." And, "in my neighborhood," she said, "you could walk up and down the street and hear blues playing on 45s, 33s, and 78s,"
Uvee Hayes grew up Macon, Mississippi, and explained that "my Mom had a juke joint ... at the age of eight I would sit up all night and hear the blues." She laughed when she intimated that people say to her: "you don't look like you sing the blues. I say how am I supposed to look? That's the stigma. How am I supposed to look?" Dr. Roz raised the stigma of the "devil's music" and negative labelling by telling how her grandfather, a delta bluesman, was told by her grandmother he "would have to give up blues to marry her." "Although," she recalled, "he later began sneaking out on weekends." She also identified a "music hierarchy that places classical at the top with jazz, R&B, soul and even rap music above the blues, which is at the very bottom." The discussion turned to the black churches that played such a central role in the community. Bernie Hayes summarized the experience: "Black preachers repeatedly saying 'this is the devil's music' gets ingrained way down in your psyche. You're brainwashed. The preachers were taught and believed that the devil met at the crossroads. It's generations of perceptions of what the blues is." Evans pointed out that many of the people clubbing on Saturday night were the same people in church on Sunday morning. She said her aunt was a good example. "My aunt played the blues Saturday night but every Sunday morning she was in church behind the organ. He [the preacher] would let her have it." Hinds had his own take this conflict: "the preacher has a problem selling the devil thing. The Blues are honest. If you haven't been through that thing the song is about....wait around, you will." Hinds offered another blues stigma or barrier to understanding, the words. "If I asked you to recite the lyrics to a blues song you won't know what the words actually mean because of the country dialect." After Uvee sang a couple of lines of "Wang Dang Doodle" he said, "those are words that rhyme to you, but they mean something totally different...who can tell me what 'tell kudu crawlin red' or 'tell Abyssinian' Ned' means?" Evans agreed, "it wasn't coding when they wrote it; they were writing about their everyday life experience." Their comments spoke directly to having respect for the underlying culture and traditions that give the words meaning. Breaking the word barrier makes the music more meaningful and relevant to both the player and listener. It shows the differences that sometimes arise between how blues music is presented and perceived. Dr. Roz cited the 1986 film, "Crossroads," as an example of negative connotations of blues music in film. In the movie, a music student is told "you can't serve two masters," referring to blues and classical music, and "excellence in primitive music is cultural," meaning blues music. "You have to be born to it." She noted the "words negative connotations with primitive music being at the lowest part of hierarchy." Uvee Hayes lived the movie. More than a decade before the film, she was attending Delta State, a black university in Cleveland, Mississippi, on a music scholarship to sing in the choir. "I was asked to be on a talent show," she told the audience. "I sang a blues tune, 'The Man is Down On Me.' The choir director kicked me out of the class and said, 'this is classic choir we don't do that'." Images in pop culture can deliberately provide a false narrative, as Bernie Hayes well knows. His anger over "Cadillac Records" is personal. "Little Walter was portrayed as a drunkard and Howlin' Wolf a fool," he said. "I grew up with these people. I was at Chess Records. I knew them. None of it was true. These images they make you think they're cultural. They're not cultural, they're racial. This is what it's about. Someone wrote those parts for a reason and the reason wasn't to make us look good." Uvee agreed, "if you don't have a history then what you see is what you will believe. That's why panels like this are so important." The panel presentation wrapped up with a question Bernie Hayes raised at the start: "What are the blues? Howlin' Wolf says blues is not enough money to pay your rent. Son House says you got blues if a lover done left you. Muddy Waters says you got blues if you can't get a job." Those definitions got more complicated with time. "Now," Bernie Hayes observed, "what used to be the plain old blues keeps changing with multiple genres: country blues, urban blues, electric blues, Delta blues...All these categories were created for monetary sake and also on racial issues too. It used to be the blues no matter who. Now it's categorized and it's monetized." Hinds explained that the musician's approach to the blues is basic, "it's all musical progression 1, 4, and 5." He also made the point that the blues are not "just the songs with the deep lyrics." He went on to say, "it's a stigma that blues are only about being downtrodden and drinking whiskey. There are happy blues. There's been so many blues written about the cars we drive, not running or running too well. You can find a blues song for anything you can think about." A floor discussion opened and Alonzo Townsend, son of blues musician Henry Townsend, music promoter, and St. Louis Blues Society board member. "What is difference between appropriation and respect and heritage?" he asked. "What we have grown and formed. Those are our roots. We want to nourish our roots without tarnishing our roots." He cited a provocative article, "White people, blues music and the problem of cultural appropriation" by Imran Rahman-Jones, that had sparked a lot of online discussion with local blues musician Marquise Knox and many others about the whitewashing of the blues. Townsend and Knox will both be panelists at the February 25 conversation in this series, "The Future: Evolution of the Blues". Townsend says there are concerns about "artists who are the face of the blues that have nothing to do with the culture. They have never stood up for any injustice or any [violation of] rights that have happened. Not only to our community and culture, but to our music." Just playing the music doesn't cut it. "You have to understand what it is before you take it off and run with it and grow it. If you don't vocalize the roots...the history gets snuffed out. The mission is to make sure that it doesn't get snuffed out." Hinds was blunt about the history. "The question is who borne the blues," he said. "That answer don't change whose music it is and where it came from. It was born in America of black people under certain conditions." And, as Bernie Hayes reminded everyone, "You don't have to put another people, a race or culture down to lift yourself up. You can lift up yourself and others with you." Marty Spikener, a local musician, spoke up. "Blues is the foundation, but it doesn't get the acclaim it should. It's a history of appropriation. When I was young I thought the blues were simple and easy. I wanted to do the complicated stuff of jazz. But I learned. An old jazz musician once told me if you don't know how to play the blues you don't know how to play anything." Another musician and community activist, Ivan Martin made the connection with Townsend's comments about injustice. He said, "Love the people that brought you the music. Make sure they can have peace, liberty and justice and be able to go home and enjoy what many of us do." He challenged the larger blues audience to see what they can do. "What's the takeaway for us?" asked one audience member who had lived in Chicago and spent time at the Checkerboard and other clubs. He said for he and his friends "there was no stigma and nothing but reverence for all the blues masters." Bernie Hayes recognized their respect. "You had to go to 43rd Street," he pointed out. "You didn't mind. You were very rare. You wanted to hear, but so many did not. All they got was a bland thing from a book or the movies which was totally untrue. I bet it changed your life, or at least your music." 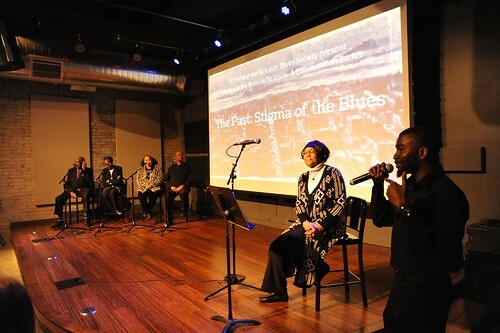 A question about the origins of the blues stigma drew several responses. Hinds said at the basic level music gets linked with bad things like "rock 'n' roll was associated with dope; blues were associated with whiskey." Bernie Hayes recognized the church divide, but also pointed to prejudice and the power that controls what people get to see and hear, which homogenizes the music. "None of the people on stage have gotten the recognition they should get for several reasons," he said. "They're black, they're not in control. It's who's in control of what you hear or will not hear. Sometimes it's omitted purposely, sometimes it's from ignorance. You've got to level the playing field." The control issue led to further discussion of how FCC deregulation under President Reagan led to conglomerates buying up many radio stations. As Bernie Hayes puts it, "They are in control because they have the money to control." Hinds was in full agreement, explaining, "it comes from a capitalistic situation in America. It comes from making money off it. You get the cheats, the liars. Don't leave out motives like money." Bernie Hayes also pointed to the on-air racial segregation of artists. "There are a lot of folks that don't want to hear black music. Stations go to great lengths not to allow certain artists to be aired in certain areas. It sounds harsh but it's true. What we can do is ask for fairness." He encouraged people to write letters to stations, demanding different music. A final question to the panel asking them to share a story of a moment when they knew their music mattered provided a sweet end to a pointed discussion. Uvee Hayes shared a story about a friend going through a rough time with her mother, who suffers from Alzheimer's. She played one of Uvee Hayes' CDs and found her mother loved one of her songs. The friend told her, "she listens to it and dances to it even though she doesn't do anything else. My friend loves it because it makes her mom happy." Evans told about the moments before St. Louis musician Oliver Sain passed away. "He was crying. I was holding his hand and he was holding mine. I sang 'Let's Stay Together' and I could just feel him going away but being with him at the same time. God bless you Oliver. I know you're loving this." Hinds said he is surprised by the young guys. "I'm a bass player by trade. It's the young guys who constantly tell me 'I'm still playing bass because I heard you'." Bernie Hayes had a special moment every day on his radio program: "I would start with 'Lift Ev'ry Voice and Sing' and then something inspirational by James Cleveland or 'I'm Black and I'm Proud' by James Brown. Every day people would come up and tell me 'Bernie you started my day'." Final thoughts of the panelists provided a poignant highlight to a candid dialogue about stigma, authenticity, culture and tradition. Their special moments helped ground a serious discussion of heritage and respect in the real-life inspiration that blues music offers as a tool for healing, common ground and building bridges. It was a sweet ending that built a bridge to the next dialogue, "The Present: Reality of Blues Music Today" taking place on Sunday, February 11 at The Stage at KDHX. Click the photo below to see more of Bob Baugh's photos of the event. Watch the entire conversation below.